No moderator, No elimination. No limits. 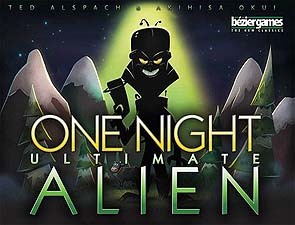 One Night Ultimate Alien is a fast game for 4-10 players where everyone gets a role: The scary technologyically-advanced Aliens, the all-knowing Leader, the tippable Cow, or others, each with a special ability. In the course of a single evening, your village will decide who among them is an Alien... Because all it takes is finding one Alien to win! Alien can also be combined with the original One Night Ultimate Werewolf, One Night Ultimate Daybreak and One Night Ultimate Vampire games.